Muzaffarnagar: Chaos erupted at a private hospital in the city after relatives of a patient created ruckus alleging that the doctor had removed the patient’s kidney without taking any consent. The hospital has been sealed post the case against the doctor. A private hospital at New Mandi area has been sealed after a doctor there was booked for allegedly stealing a kidney of a patient during surgery to remove stones from the vital organ, police confirmed to PTI. According to the police, a 60-year-old patient approached Dr Vibhu Garg of Garg Hospital with complaints of kidney stone. The patient wanted to get his kidney stone removed through laparoscopic surgery for which he had contacted the doctor. The patient’s son had alleged that Dr Garg had not discussed the possibility of kidney removal before the operation. His family told the police that the doctor had assured them that the operation would hardly take an hour. However, the actual procedure went on for over three hours. They also said that the patient was administered two units of blood, reports HT. In their complaint, the relatives alleged that the doctor removed and kept the patient’s kidney in an ice box, and when he was asked about the cause of kidney removal, he could not provide any satisfactory answer. “The family members claimed that they have also found the ‘stolen’ kidney, hidden in an ice bag,” Circle Officer (CO) Yogender Singh informed the news agency. Later, some of the other relatives of the patient reached the hospital on getting the news of ‘kidney stealing’ form the family, and created a ruckus, adds HT. A police team led by New Mandi CO Yogender Singh and Inspector Har Sharan Sharma pacified the relatives. A case has been registered against Dr Garg under section 338 of the Indian Penal Code and three staff members have been booked too. However, the doctor has completely denied the said allegations. 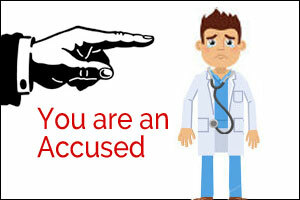 He claimed that he had discussed all possibilities of the procedure with patient’s family. “He said the size of the kidney stone (15 mm) was very big,” Inspector Sharma stated. Where is IMA ? What is it doing? ?